A wide-spread African concept is that the sky is a solid dome, perhaps made of blue rock, resting on the Earth, upon which the Sun moves. The traditional Tswana idea is that stars are holes in the rocky vault that is the sky. The Nyae Nyae !Kung Bushmen saw the sky as the dwelling place of all the divine beings and spirits of the dead. The “things of the sky” generally do not influence or reflect the affairs of man, the !Kung taught, nor do they affect the weather, the growth of vegetation, or other conditions of the earth; they are in a realm of their own. In Xhosa, a star is inkwenkwezi, inkanyezi in Zulu, nyenyedzi in Shona, dinaledi in Sotho, tinyeleti in Tsonga, maledzi in Venda, linaleri in Setswana, and nyota in Swahili. While the /Xam Bushmen believed the stars were formerly people, some !Kung Bushmen taught that stars are, in fact, small creatures, and look like tiny porcupines – they have little legs, ears, teeth and are covered with tiny spines. Another !Kung account says that stars are actually ant lions, watching from overhead with their bright eyes. When they are hungry and see an ant, they quickly fall to the ground to catch it. Some say that all the stars fall to the ground each morning, and we see them on earth as insects. The Ibibio of Nigeria spoke picturesquely of the stars as “Sand of the Moon”. The Sun is ilanga in Xhosa and Zulu, duvha in Venda, zuva in Shona, and letsatsi in Sotho. The Nyae Nyae !Kung Bushmen think of the Sun as a “death thing” because of its searing heat and the association with thirst, hunger, and exhaustion. The /Xam Bushmen would ask the Sun, early in the morning before they set out to hunt, to steady the hunter’s arm when aiming at game. The Sun was originally a man, the /Xam said, whose head shone brightly. But he was a lazy fellow and would sleep late, keeping his light to himself. So one day, out of desperation, the First Bushmen chopped off his head and threw it up into the sky so that his light could be shared with everyone. On rare occasions, the Moon passes between the Earth and the Sun, resulting in a solar eclipse. If the alignment is exact, then the entire Sun is momentarily blacked out. Such a total eclipse was not a welcome sight to the Xhosa, who saw it as an ill omen. In Zulu, Sotho and Tswana traditions this was called “the darkening of the Sun”, ukufiphala kwelanga and fifalo ya letsatsi respectively. The Venda spoke picturesquely of mutsha-kavhili, “the two dawns”. The Moon – iNyanga to the Xhosa and Zulu, Nwedzi to the Shona and Venda, and Ngwedi to the Sotho and Tswana – is probably the most obvious feature in the night sky, because of its size, brightness, and changing appearance (phases). As the Moon orbits the Earth it goes through a sequence of phases, from New Moon (invisible) to crescent, half-moon, Full Moon, half-moon, and back to New Moon. To the Kora KhoiKhoi, the Moon was kham, “the Returner”; the Nama KhoiKhoi spoke of khab. The KhoiKhoi also considered the Moon as “the Lord of Light and Life”, and would sing and dance at times of New and Full Moon. The Nyae Nyae !Kung Bushmen said that the crescent phases with sharp points was male, while the Full round Moon was female. The Xhosa considered the time of New Moon as a period of inaction. When it reappeared as a crescent in the evening sky, it was cause for celebration. Important events were scheduled to take place around the time of Full Moon. Also at Full Moon the mothers would de-worm their children, believing that at this time the worms collected in one place and could be effectively treated. The Naro Bushmen taught that when the crescent Moon slopes downward, it is said to be looking into a grave and this is a sign that many people will die in that season. A crescent pointing upward was a favourable sign. The round Full Moon is a sign of satisfaction and that people will find plenty of food. In /Xam Bushmen mythology, the Moon is a man who has made the Sun angry. The Sun’s sharp light cuts off pieces of the Moon until almost the whole of the Moon is gone, leaving only one small piece. The Moon then pleads for mercy and the Sun lets him go. From this small piece, the Moon gradually grows again until it becomes a Full Moon. The /Xam also have another account of how the Moon came to be. In the old times, it was said, the Moon was one of the leather sandals of the Mantis-god /kaggen. The sandal was placed in water to soften it somewhat, but this angered the water spirit who then froze the water, locking the sandal in ice. When /kaggen saw the frozen sandal he discarded it, throwing it up into the sky, where it became the Moon. Whatever its origin, the /Xam considered the New Moon as being able to influence hunting and the gathering of ants’ eggs, and when the crescent was sighted, they would ask for its assistance. The surface of the Moon has dark and bright markings; flat lava plains and rocky highlands, respectively. In many African traditions these markings are said to resemble the figure of a man or woman carrying a bundle of sticks. Under certain atmospheric conditions, a “moon bow” can form, appearing as a large ring around the Moon. To the /Gwi Bushman, such a ring was a sign that food will be plentiful. The Southern Cross (Crux) and the two bright Pointers (alpha and beta Centuari) are probably the most recognizable of the southern stars, and they feature prominently in African star lore. In Sotho, Tswana and Venda traditions, these stars are Dithutlwa, “The Giraffes”. The bright stars of Crux are male giraffes, and the two Pointers are female. The Venda called the fainter stars of the Southern Cross Thudana, “The Little Giraffe”. They also say that the month Khubvhumedzi begins when the crescent Moon can be seen for the first time and, at the same time, the lower two giraffe stars are just below the horizon and the upper two are just visible. Sotho lore tells that when the giraffe stars are seen close to the south-western horizon just after sunset, they indicate the beginning of cultivating season. The /Xam Bushmen saw the two Pointers as male lions; they were once men, but a magical girl turned them into stars. The three brightest stars of the Southern Cross they saw to be female lions. To the Khoikhoi, the Pointers were known as Mura, “The Eyes”, of some great celestial beast. The Coal Sack, a large dark nebula near the Southern Cross, is known as the “Old Bag of the Night” to the Nyae Nyae !Kung Bushmen. The long axis of the Southern Cross points towards a bright star called Achernar. This star is called Senakane (Sotho, Tswana) and Tshinanga (Venda), meaning “The Little Horn”. Brighter still than Achernar is Canopus, one of the brightest stars in the night sky. It is widely known in southern Africa as Naka, “The Horn Star”. In Sotho tradition, a careful watch was kept for Naka about the end of May. Sotho chiefs awarded a cow for Naka’s earliest sighting. The day of the sighting the chief would call his medicine-men together. Throwing their bone dice, the doctors would judge whether the new season would be good or bad. The appearance of Naka also heralds coming of winter and browning of the veld. When Naka appeared before sunrise, the Tswana knew it was time to start breeding their sheep. In Venda tradition, the first person to see Nanga in the morning sky (in May, heralding winter) would climb a hill and blow the phalaphala (black sable antelope horn) and he would receive a cow as a prize. The Zulu knew Canopus as isAndulela, a messenger appearing at the end of Autumn, the harvest time, and also as inKhwenkwezi, “The Brilliant Star”. The /Xam Bushmen believed that Canopus could influence the availability of ants’ eggs, a rich source of nourishment, and they called it “The Ant Egg Star”. Along the curved body of the scorpion, just before the tail section, lies a close pair of stars (mu-1 and mu-2 Scorpii), which the Khoikhoi called xami di mura, “The Eyes of the Lion”. Near Scorpius is a conspicuous circlet of stars known as Corona Australis, the Southern Crown. The /Xam Bushmen had a tale about a group of men who sat eating together when a bewitched girl look upon them, turning them into these stars. The bright star Fomalhaut lies in a rather star-poor region and is prominent in the summer sky. It is called Ndemara, “The Sweetheart Star”, by the Shona, and Ntshuna, “The Kiss Me Star”, by the Tswana. The visibility of this star was supposed to indicate the time for lovers to part before their parents discovered them. (Compare this with the tale about Venus the Evening Star, below). Another prominent southern star is Peacock (alpha Pavonis); the /Gwi Bushmen call it “The Female Steenbok”. On a moonless night under a dark sky, two interesting “clouds” can be seen to the south, one cloud much larger and brighter than the other. These are the Magellanic Clouds, or the “Cape Clouds”, and are actually entire galaxies, thousands of light years away. The Ju/Wasi and !Kung Bushmen said that the larger cloud was a part of the sky where soft thornless grass grows, like the kind they used for bedding. One day, they say, God climbed onto the large cloud and went hunting. Several other Bushman groups saw the two clouds as male and female steenbok. The Sotho saw the clouds as the spoor of two celestial animals. The large cloud was Setlhako sa Naka, “The Spoor of the Horn Star” (Naka, Canopus) and the smaller cloud was Setlhako sa Senakane, “The Spoor of the Little Horn Star” (Senakane, Achernar). Tswana folklore tells that when the small cloud appeared more clearly than the large cloud, a drought would follow. On a dark night, the Milky Way can be seen, a dim band of light stretching from horizon to horizon. Various groups (including the Venda, Setswana and Sesotho) described it as a supernatural foot path across the sky along which the ancestor spirits walked. Many peoples referred to it as “Night’s backbone”, “Sky’s spine” and “God’s back”, suggesting the idea that the Milky Way held up the sky, or maybe held it together. In /Xam Bushmen star lore, the Milky Way was created by a girl of the ancient race who scooped up a handful of ashes from the fire and flung it into the sky. This made a glowing path along which people could see the route to return home at night. She also threw bits of an edible root into the sky, the old (red) pieces creating red stars and the young (white) pieces creating white stars. On summer nights, the brilliant constellation of Orion, with Taurus the Bull on one side, and bright Sirius on the other, graces the southern night skies. Orion is instantly recognizable by its three bright stars in a short line (Orion’s Belt), and the brilliant orange star Betelgeuse. Rigel is the other bright star in Orion (opposite Betelgeuse from the Belt Stars). Roughly between Rigel and the Belt Stars lies Orion’s Sword, which appear as three fuzzy stars. Several cultures identify the Belt Stars as animals. They are seen as three pigs by the Sotho (Makolobe), Tswana (Dikolobe), and the Karanga of Zimbabwe (Nguruve). The Sotho called Orion’s Sword Dintshwa, and the Tswana called it dintsa le Dikolobe, meaning “The Three Dogs are chasing the Three Pigs”. The /Xam Bushmen said the Belt Stars were “Three Male Tortoises (hung on a stick),” and Orion’s Sword was “Three Female Tortoises (hung on a stick)”. To the Nyae Nyae !Kung Bushmen, Orion’s Belt was “The Three Zebras”, a male animal flanked by two females. The Songye of Zaire speak of the Belt Stars as aspibwe na mbwa na nyama “a Hunter with a Dog and an Animal”. Similarly, the !Xu Bushmen saw “a Man, a Dog, and a Buck”. The Zulu referred to Orion’s Sword as oNdwenjana; the meaning isn’t clear because it can either indicate a tall object/man/tree, or a type of long-stemmed flower, such as a lily. The Masai charmingly refer to the Belt Stars as “Three Old Men Pursued by Lonesome Widows”! Nearby Orion lies Sirius, the brightest star in the night sky. Sirius dominates the morning sky in July, and it late winter is rises early. The Sotho knew it as Kgogamashego, “Drawer Up of the Night”. To the Tswana it was Kgogamasigo, “Pulls the Night Across”. The Venda called it Khohamutsho “Pulling Out the Dawn”. The Zulu had various names for it, such as inDosa and inDonsemasuku, meaning “straining, or pulling”. The /Xam Bushmen called Sirius “The Grandmother of Canopus”, because Sirius rises after Canopus, and the elderly usually follow behind the more agile youths. In Xhosa, the star is known as iQhawe, “The Champion”, presumably because it is the brightest star in the night sky. Taurus the Bull has its own bright orange star, Aldebaran, and not far off is the beautiful star cluster the Pleiades, also called the Seven Sisters. The /Xam Bushmen saw Aldebaran as “The Male Hartebeest”, with Betelgeuse as its mate. The Pleiades is a prominent cluster of stars, of which usually six or seven bright members can be seen. To many pastoralist groups of southern Africa, the first visibility of the Pleiades in morning twilight (in August or early September) announced the start of the planting season, and usually also marked the beginning of the year. The /Xam Bushmen said the Pleiades are one of “summer’s things”, and the Khoikhoi used the Pleiades to forecast the start of the rainy season. In Kiswahili (East Africa & Zanzibar) they are Kilimia, “The Ploughing Stars” or “The Digging Stars”. There is a Swahili proverb that says: “If the Digging Stars set in sunny weather they rise in rain, if they set in rain they rise in sunny weather.” Similarly, they are Kelemera to the Nyabungu of Ruanda, Lemila to the Nyasa of Malawi, Selemela in Sotho, Shirimela in Tsonga, Selemela in Tswana, Tshilimela in Venda, and isiLimela in Xhosa and Zulu. The Xhosa would watch for the first appearance of the isiLimela in June. It is said that the month of the Digging Stars, Eyesilimela, symbolized new life in man. The coming-out ceremony of the abakwetha circumcision school, when boys would become men, was determined by the appearance of this stellar grouping, and it is the custom for Xhosa men to count their years of manhood from this date. The //Gana Bushmen say that the Pleiades are the wives of Canopus and Sirius, and the men’s younger brother is Achernar. Aldebaran and the Pleiades are described by the Ibibio of Nigeria as “The Mother Hen and her Chicks”. The Sotho and Tswana had a rule for finding direction at night: if you want to travel west, keep the Southern Cross on your left hand, and Selemela (the Pleiades) on the right. Near Orion and Sirius is the bright star Procyon. The /Xam Bushmen considered it “The Male Eland”, who has two wives (Castor and Pollux, see below). Rigel and Betelgeuse, with Sirius and Procyon, were known as Magakgala or Mahakala to the Basuto, Lobedu, Northern Sotho and Tswana. When these stars were visible in the early evening, they knew it was time to harvest the corn. A prominent northern star is Arcturus, which various Bushmen groups called “The Fire-Finishers’ Child”, because it appeared in the early morning hours, when the camp fires had died down. In Swazi tradition, the star is Lweti, and is visible in the morning sky before sunrise in November, at the time when women begin their day’s work. Capella is a very bright star that never rises very high above the northern horizon as seen from southern Africa. The Zulu call it iNtshola, “The Cattle Thief”. The Nyae Nyae !Kung Bushmen called it “Green Leaf Horn” and knew that when it was visible, the first flowers would bloom with the coming of the season of rains. Altair is another bright star that lies toward the north. It is known as “The Female Steenbok” to the /Gwi Bushmen. Located lower than Altair is the bright star Vega, which they call “The Male Steenbok”. Castor and Pollux, the two bright stars of Gemini, were considered by the /Xam Bushmen to be “The Female Elands”, the wife of Procyon. The small but striking northern constellation Delphinus the Dolphin is known in Setswana as gakgala, “The Mopane Worm”. Spica is a lone bright star in the modern constellation Virgo. The //Gana Bushmen knew it as “The Pig Star”. In Zulu custom, it is known as iNqonqoli, “The Wildebeest Star”, and its seasonal visibility coincides with the calving season of the wildebeest. Regulus, the brightest star of Leo, was known to the /Gwi Bushmen as /edzini, “The Fire-Finisher” which only sets when the firewood has been exhausted. The Evening Star, usually Venus, is visible from time to time in the west after sunset. When this bright star appears in the evening sky, the Xhosa called it U-cel’izapolo, “One Who Asks for Milk from a Teat”, because this would be the time when boys playing in the fields would rush home to milk the cows. The Evening Star was also known as Madingeni, “The Dating Star”. In the olden days, boys and girls were not allowed to date each other in public, so they would arrange a secret get-together when Madingeni became visible. Many peoples linked the evening appearance of Venus with supper time. The Ndebele called it Lykwela mkobe, and the Zulu spoke of iCelankobe, meaning “Asking for Mealies”. The Sotho knew it as Kopa-dilallo, the Tswana as Kopadilelo, and the Venda as Khumbela tshilalelo, meaning “Asking for Supper”. When Venus is visible in the morning sky just before sunrise, it is the Morning Star. The Herero called it okanumaihi, “Little Drinker of Sweet Milk”, on account of its appearance at milking time. The Nyae Nyae !Kung Bushmen called it “Old Star” and said that it guided the Sun across the sky. In Xhosa tradition, the Morning Star is iKhwezi Iokusa and is associated with diligence. Travellers, who sleep out in the open, would see it and know it was time to resume their journey. Young women and girls also wake up during this time to start doing their daily chores. Girls are often named after Venus and called nomaKhwezi, with the hope that they, too, will be diligent when they grow up. Venus is, in fact, so bright that it can at times be seen in broad daylight. Xhosa boys, out in the veld herding, would try to spot it as part of the challenge to becoming a true shepherd. In most cultures of the world, meteors (sometimes called shooting stars) are regarded as signs of important earthly events. Sometimes, these are good events. The San Bushmen of northern Namibia and the Masai of Kenya and Tanzania considered meteors to be favourable omens, foretelling good rains. In Tswana mythology a very bright meteor is an indication of a good season ahead. Sometimes, meteors are seen as a bad omen. To the !Xu Bushmen a meteor was an evil spirit racing across the sky to cause mischief among the people. The /Xam Bushmen, however, said that the stars knew when a Bushman dies, and a falling star announces the death of one of them. Other interpretations of meteors are neither good nor bad. The Zulu, for example, say that meteors resulted from celestial cattle hastening to new grazing in another part of the sky. When the cattle drag their hooves they break through the floor of the sky and create streaks which soon fill in with mud. The Karanga of Zimbabwe would shout “Li-i-I Thobela!” when they saw a meteor, thinking that a god or ancient chief was shooting across the sky. Comets were also seen as important signs of earthly events. The Masai considered comets to be the embodiment of important gods. In Xhosa tradition, a comet, Uzatshoba, is associated with bad luck, calamity, wars and death. There was also a strong belief that comets predicted the death of a chief. To the Sotho, comets were naledi tsha mesela, and to the Zulu, inkanyezi enomsile, meaning “stars with tails”. Bleek, W.H.I. (1875) Second Report Concerning Bushman Researches with a Short Account of Bushman Folk-lore. Saul Solomon: Cape Town. Hammond-Tooke, W. (1893) The star lore of the South African natives. Trans. S.A. Philos. Soc, 5(2), 304-312. Hewitt, R. L. (1986) Structure, meaning and ritual in the narratives of the Southern San. Quellen zur Khoisan-Forschung, 2. Hollmann, J. C. (2000) Customs and Beliefs of the /Xam Bushmen. Wits University Press/Ringing Rocks Press. Lloyd, L. C. (1889) Short Account of further Bushman Material collected. David Nutt: London. Marshall, L. (1986) Some Bushman star lore. In: Vossen, R. & Keuthmann, K. (eds) Contemporary studies on Khoisan. Quellen zur Khoisan-Forschung, 5, 169-204. Snedegar, K. V. (1995) Stars and seasons in southern Africa. Vistas in Astronomy, 39, 529-539. Snedegar, K. V. (1995) Astronomical traditions of Southern Africa. Unpublished manuscript, deposited at SAAO. Warner, B. 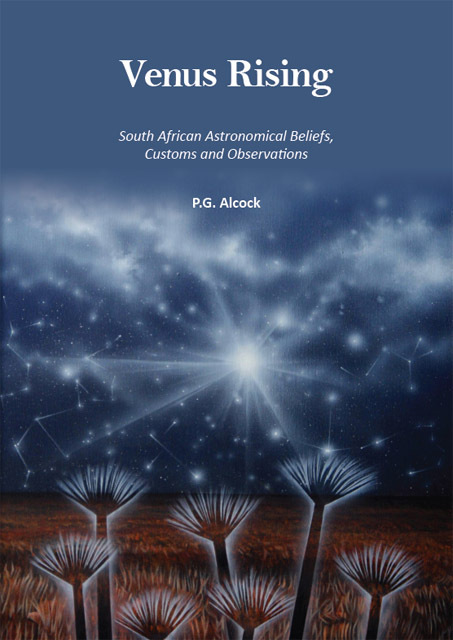 (1996) Traditional astronomical knowledge in Africa. In: Walker, C. (ed) Astronomy Before the Telescope. British Museum Press: London. p 304-317.